Here’s my latest The Other Side column for ConservativeHome, published here on Tuesday. It was my attempt to highlight how distorted the economic debate has become… All the blame for the Great Recession heaped on the last Labour government for spending plans all parties were signed up to. And the continuation of the Great Recession blamed on the Coalition’s Plan A, ignoring other factors and assuming the Coalition has actually stuck to Plan A (they haven’t). To my surprise (and to their credit) readers’ comments were much less mad than usual. My thanks as ever to the site’s editors, Paul Goodman and Mark Wallace, for giving a Lib Dem space to provoke – constructively, I hope. History is written by the victors. And so it is that the history of this Parliament is being written by George Osborne. Labour failed to fix the roof, then crashed the car, leaving the country up debt-creek. By contrast, the Coalition, sticking resolutely to Plan A, has got the economic ship back on the rails ready for take-off. Okay, the metaphors are flawed, but not half as much as this version of events. Let’s wind back to September 2007. The Conservatives, spooked by incoming Prime Minister Brown’s brief popularity (‘Not Flash, Just Gordon’), announced they would stick to Labour’s spending plans. The party’s Shadow Chancellor, one George Osborne, confirmed that “under a Conservative government, there will be real increases in spending on public services, year after year”. The aim was clear: to neutralise Labour attacks that the Tories would take an axe to public spending. If only someone had been around at the time to point out to Labour how “out of control” their budgets were, eh George? The reality is that all three major parties – together with far too many British households – were addicted to spending beyond their means during the “no more boom and bust” era. This growing indebtedness at individual and national level didn’t cause the financial crisis – we need to look across the Atlantic for its sub-prime trigger – but it did amplify it, and we’re still paying the price. So Mr Osborne’s first claim – that Labour profligacy broke the economy – is an exaggeration. What of his second claim, that the economy is on the mend thanks only to the Coalition’s resoluteness in adhering to Plan A? This, too, is a distortion. Plan A – aka austerity – was simply expressed: the elimination of the deficit within one parliament through fiscal consolidation. This failed. It failed owing to a combination of factors, only some of which were within the Coalition’s control – most importantly, its decision to carry through Alistair Darling’s plans to cut first the easy parts of public spending, capital investment, which contribute most to economic growth. But Plan A failed also for reasons beyond the Coalition’s control (“events, dear boy, events”), such as rampant inflation in global commodities, which squeezed real wages and sucked private consumption out of the economy. Oh, and the Eurozone crisis on our doorstep didn’t help much either. As Plan A’s failure became apparent, the Coalition responded like good Keynesians: “When the facts change, I change my mind. What do you do, sir?” The 2012 spending review boosted capital investment and extended the period of fiscal consolidation well into the next parliament. It wasn’t quite Plan B. But it was no longer Plan A either. You can call it Plan A- or Plan B+, according to taste (maybe Plan B¾, for the Harry Potter fans out there). However, it suits both the Coalition and Labour to pretend that Plan A was never diluted at all. This allows the Coalition to repeat ad nauseum its fantasy narrative that it has held fast. Here, for example, is Nick Clegg a couple of months ago: “Despite the endless clamour to change course on our economic strategy, we held our nerve and resisted calls for a Plan B – and it’s paying off.” And it allows the Opposition to stick to its attack lines, for instance Ed Miliband blasting the 2013 budget as “more of the same” when it clearly wasn’t. This is a little bit of history repeating itself. In 1980 Margaret Thatcher famously declared she wasn’t for turning from Plan M – aka monetarism – despite the cries of pain as the British economy shrank by 2 per cent, unemployment spiked to 8 per cent, and public spending soared higher than it had under Jim Callaghan. “You turn if you want to,” she declared. One person who took The Lady at her word was her Chancellor, Geoffrey Howe. He promptly U-turned in his 1981 budget, abandoning Thatcherism’s strict monetarist experiment in favour of cutting interest rates and raising taxes. As the economy recovered so the legend was born that the Conservatives had stuck to their guns, a claim aided and abetted by their own puffery and by their opponents’ tribal accusations. Time to bring the story up to the present day. Ed Miliband’s vacuous reply to George Osborne’s budget last week highlighted a self-evident truth about his party’s economic strategy: Labour has boxed itself into a corner. Shouting at the Coalition for sticking by Plan A was always a time-limited tactic. At some point, growth was bound to kick in. That it has kicked in sooner and faster than was predicted a year ago is probably due to the Coalition stealthily tacking away from Plan A. 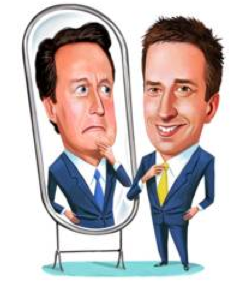 If Eds Miliband and Balls were smart, they would have praised the Coalition’s decision to change economic course in 2012 – its slowing pace of deficit reduction, the £5 billion extra capital investment – and trumpeted it as a new and welcome direction in line with their own thinking. It would have taken courage, to be sure, for Labour to love-bomb the Coalition like this. However, Ed Balls has shown he can live up to his surname before – his August 2010 Bloomberg speech, ‘There is an alternative’, showed off his cojones, warning of the dangers of rigid austerity long before it was fashionable, and earning him deserved credit. If he could have shown similar nerve in 2012 – instead of parroting the trite-and-tested ‘ConDem cuts’ mantra beloved by his party – he would by now have compounded that political capital. But the short-term opportunism of kicking a government when it was down over-rode the long-term opportunity to associate Labour with the recovery. As a result, Miliband and Balls have ended up looking like the Statler and Waldorf of the recovery, reduced to the role of spectators heckling the Coalition from their cushy balcony seats. It was always going to be tough gig, restoring trust in Labour’s economic competence after the crash. The balance of probabilities was always that the Coalition would reap the electoral dividends of not being in power when the banks collapsed and of being in power when economic growth returned. The Two Eds must have known that too. Yet they seem to have genuinely believed Labour could win an election on cruise control. All their thinking appears to have been devoted to thinking what they would do in government, forgetting that they first have to win in 2015. History is written by the victors – but only when the losers give them a free hand. What your otherwise excellent analysis ignores, is that the Tories had no alternative but to promise to match Labour's spending plans. You don't think they actually thought it was a good idea?? They made the promise because not to have done so, in 2007, would have been electoral suicide at a time when an election was quite likely. This was before the crash, and back then the public simply didn't understand that constant over-spending was in any way damaging. In those days, the more you spent, the more chance of getting elected. In that limited sense, the crash has been quite good for the country – although with spending clearly out of control, a harsh lesson for the public was inevitable at some point. Whether the Tories would *actually* have matched Labour's spending had they got into power after a 2007 election, who knows? A choice between going against the grain, or breaking a promise. Would have been very difficult for them. Don't forget that Labour constantly made the case that the Government cuts were being driven by the Tories' ideogical agenda (i.e. not in response to the crash). That's a claim you certainly cannot make, if you also say that the Tories would have matched Labour's spending had there been no crash!